Cornielje H. 18 September 2016, posting date. The potential of a new understanding of CBR for the field of leprosy. In Scollard DM, Gillis TP (ed), International textbook of leprosy. www.internationaltextbookofleprosy.org. This chapter presents first of all a brief historical overview with critical reflections of Community Based Rehabilitation (CBR) in the ‘mainstream disability world’. It also discusses, more specifically, the area of rehabilitation of people (with disabilities) affected by leprosy. Finally, the chapter provides a contemporary critical analysis of CBR and directions for the future. One should however note that the evidence base for CBR remains limited; besides some systematic literature reviews , , there is hardly any evidence for various claims that are made about CBR. There is an urgent need to measure the outcomes and impact of CBR as well as assess the cost-effectiveness of CBR. CBR: A panacea to the problems of people affected by leprosy? The World Health Organization (WHO) formally initiated CBR in the late seventies. Other United Nations’ agencies, such as the International Labour Organization (ILO), followed later . However, some scholars  state that CBR has origins dating back many centuries. These scholars indicate that the foundations of CBR development of the past 40 years presumably would have been stronger if they were rooted in these documented historical practices. Some 4,000 years of historical evidence exists in Africa of people with disabilities, healing therapies, assistive gadgets, community attitudes, and self-organized disability groups (see historical section in web bibliography, Miles, 2003). Systematic documentation of disability histories in Africa has only recently begun to accumulate. The potential exists to produce detailed accounts with strong roots in earlier centuries. A formidable example, based on doctoral research, is the account by Eric Silla of people with leprosy in Mali, starting from the Arabic descriptions by Ahmad Baba al-Tinbukti, c. 1600, and proceeding to personal accounts of individuals organizing themselves for group campaigns throughout the 20th century, with medical advances and complex social changes shifting the battlegrounds and their struggles for identity. Yet the earlier centuries have been ignored almost entirely, for various reasons. The main reason seems to be the scarcity of published knowledge and the lack of detailed studies in African social history. Euro-American prejudices also play a part, such as an ill-informed conviction that earlier Africans all lived ‘primitive’ or ‘savage’ lives, in which disabled babies were killed, elderly disabled people died if they lagged behind their nomadic tribe, and medical care for disabled youths and adults was minimal or actually harmful. The yen for ‘pioneer angel’ status, i.e., to appear as the ‘first’ savior of a downtrodden minority, may motivate some people to ignore, suppress, or fail to search for evidence of earlier activities. Painting Africa as a perennial disaster area enables the less informed aid agencies to exhort the public to “help save a blind child” (etc. ), rather than to ask whether modern African cultures have any historical strengths on which self-help programs could be based. Even within living memory, lessons from useful work from the 1950s to the 1970s are little known and rapidly disappearing. As a result, CBR from 1980 onwards has too often looked like yet another foreign import, rooted in alien ideologies, funded by distant countries, irrelevant to the actual needs of, for instance, disabled Africans, coupled with aid agency ignorance about the widely varying situations of disabled people across Africa and elsewhere , . 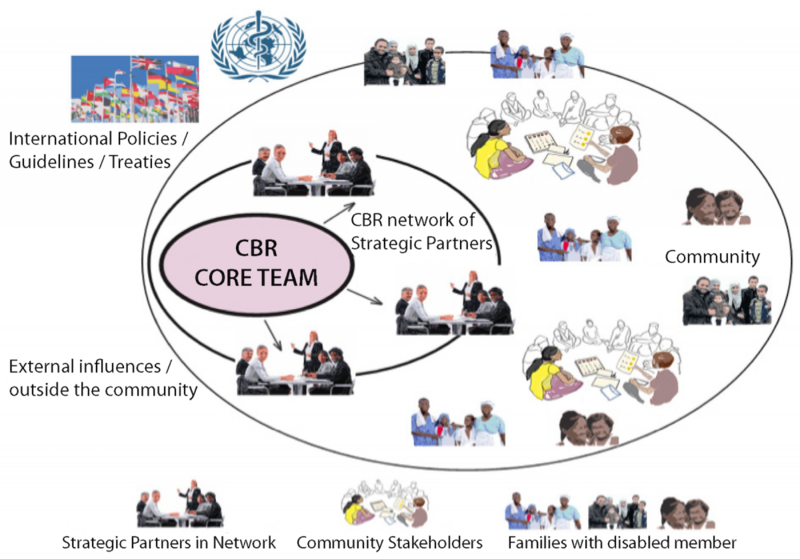 CBR, as it was introduced by the WHO in the late seventies, was to a great extent based on the principles of Primary Health Care and meant to address the mainly (medical) rehabilitation needs of people with disability in low-income countries . Then, CBR aimed to address the serious shortage of rehabilitation services, resources, and professionals for the majority of people with disabilities by providing services in and with the community using predominantly local resources. Community field workers often had minimal training and, working as volunteers, offered basic (mainly medical-technical) rehabilitation services. At that time, the focus was on strategies, which could be understood and carried out by these field workers, local volunteers, or family members. The primary focus of CBR was to maximize individual functioning. Improvement of physical, social and psychological functioning of the person with a disability. This starting point (still) implies a strong focus on the rehabilitation of individuals and (still) seems much rooted in the medical model of thinking and, as such, was, and is, often critiqued by the global disability movement. Solidarity with those who are denied their rights and working for the adaptation of society. This starting point illustrates a development in the direction of the social and human rights models, which do not regard disability as an individual ‘tragedy’ but appreciate the impact that a multitude of barriers within society have on well-being, equal opportunities, and inclusion in that very same society. Working towards integration and equality of rights of those with disabilities within the mainstream of community life. This starting point clearly and boldly states that people with disabilities have equal rights. Those who worked on this definition and the principles of CBR clearly intended to ensure that people with disabilities have an equal enjoyment of rights as other citizens. Nevertheless, this starting point focuses on integration rather than inclusion. CBR is achieved through multi-sectoral collaboration. The starting points and principles of CBR continue to evolve with the realization that CBR is an approach and an attitude towards rehabilitation. It is an approach whereby people with disabilities and caregivers define their own needs and negotiate with rehabilitation workers and policymakers to improve their living circumstances and to play their full part in society. While the medical disability model initially dominated the CBR approach, it has evolved into a community development strategy that aims for the participation of people with disabilities in society with equal opportunities and inclusion. Contemporary CBR is in fact a disability inclusive development (DID) strategy. The disability field increasingly recognizes CBR as an important instrument for implementing the United Nations Convention on the Rights of Persons with Disabilities (UNCRPD) and in achieving the Millennium Development Goals . Whether that recognition will be sustained is a big question mark. For example, within discussions about the UN’s Sustainable Development Goals (see https://sustainabledevelopment.un.org/?menu=1300), little or no reference is made to CBR as such, despite the promotion and goal of disability inclusive developments. This comment by Haig et al. gives the impression that the medical establishment continues to consider itself superior to the rehabilitation process. Yet, to play an even more significant role in the lives and rehabilitation pathways of people with disabilities, medical professionals, in general, should probably have a humbler attitude, being aware that they are not counted among those who work and live in the periphery and slums of society, which are severely underserved and where the poorest of the poor live. It was precisely this lack of access to rehabilitation services that became a catalyst to the development and implementation of CBR. In 2003 in Helsinki, Finland, the UN organized an international consultation to review CBR . Following this review, a group of more than 180 individuals and nearly 300 organizations, mostly from low-income countries around the world, were involved in the development of new CBR Guidelines . The year 2010 marked the launch of these CBR Guidelines in Abuja, Nigeria: a series of seven books, each approximately 70 pages of text, that together weigh 2.2 kilograms. The introduction book of the CBR Guidelines explains issues such as disability models, the principles of the UNCRPD, and their intrinsic link with the CBR principles. It furthermore explains, in a rather superficial way, the governance and management of CBR. 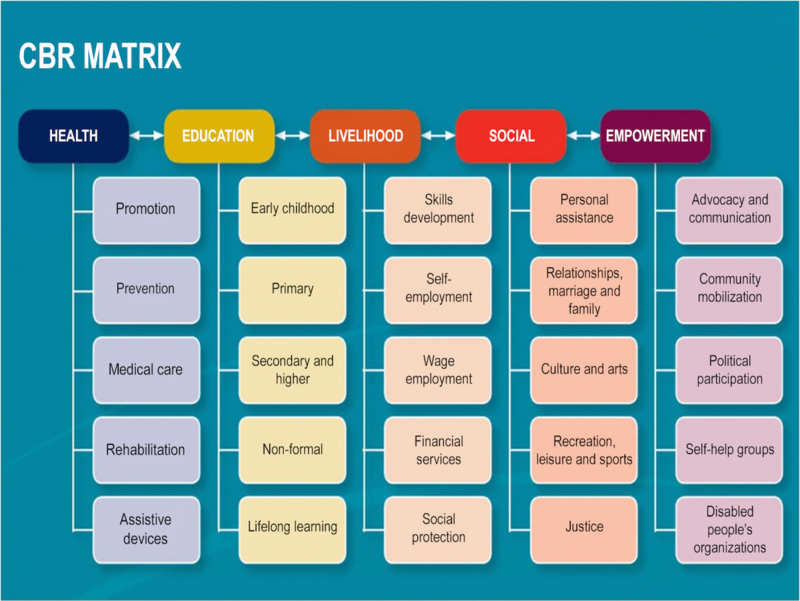 The central part of the guidelines consists of five books formed around the so-called CBR matrix, a five by five matrix that consists of five key life domains (called components), each of which consist of five sub-domains (called elements) (Figure 1). Each book discusses one component: health, education, livelihood, social (life), or empowerment. The last book is a supplementary book and deals with issues that traditionally receive insufficient attention in mainstream CBR, i.e., AIDS, mental health, and humanitarian crises, as well as leprosy. The fact that leprosy is specifically discussed in the final book clearly demonstrates that leprosy still has a special place in the mainstream disability world and is not just seen as one of the many conditions that could lead to disability. Nevertheless, a large group of authors and contributors to the 2010 WHO-CBR Guidelines preferred to mention leprosy in the main text and not to treat it as a separate issue. On the other hand, there were people—including the author of this chapter—who pleaded for a combination of (a) a regular mention of leprosy in the main text as well as (b) special attention for leprosy in a supplementary booklet. This group of people felt, on the basis of years of practical experience, that the mainstream CBR field rarely includes people affected by leprosy in its projects and programs. Thus, this group wanted to ensure that the specific attention for leprosy in the supplementary booklet would highlight the importance of including people affected by leprosy in mainstream CBR. For various reasons, mainstream CBR programs have been ignorant about the needs of people with disabilities due to leprosy. It is only in exceptional cases that mainstream CBR programs pay attention to people affected by leprosy in its services or interventions. The general exclusion of people affected by leprosy from mainstream (rehabilitation) services illustrates a hierarchy within the disability world itself . This hierarchy becomes evident, for example, when one reviews the membership of Disabled People Organizations or mainstream self-help groups: normally speaking they do not have members affected by leprosy. It is not possible in this chapter to provide a robust explanation for this situation, but there is sufficient anecdotal evidence about some of the reasons. Stigma may be one reason that explains why people with leprosy usually do not benefit from CBR programs. That stigma (see Chapter 4.5) may be reflected from the CBR management teams, from the professionals and field workers, or even from other people who have disabilities or are affected by leprosy themselves , . Yet there may be another important explanation of why mainstream CBR programs generally do not include people affected by leprosy in their programs. This aspect can easily be overlooked: the treatment and rehabilitation of people affected by leprosy, although currently more organized in an integral way as part of existing public health systems, is often still organized in vertical or semi-vertical ways , . As such, leprosy programs, even those that have a more comprehensive focus than only health, tend to focus exclusively on people affected by leprosy. As a result, these leprosy programs also have a tendency to unintentionally exclude their own target group—people affected by leprosy—from benefiting from mainstream (CBR) developments. Too often special programs for people with disabilities due to leprosy, e.g., in the sphere of self-care, self-help, or income-generating activities, are developed for people affected by leprosy exclusively. At the beginning of the 21st century, many leprosy organizations regarded Socio-Economic Rehabilitation (SER) as equal to CBR , . Similarly, today we see that experts and academics often label self-care groups and/or self-help groups as if these are in themselves CBR. Thus, in a way, the leprosy world ‘re-invented’ the meaning of CBR once again. The driver behind this ‘re-invention’ of CBR may be certain—genuine—interests, which, for example, become clear in the development of the WHO/ILEP Technical Guide on Community Based Rehabilitation and Leprosy in 2008 . It is interesting to see that this technical guide, which only discusses leprosy, was developed just a few years before the launch of the 2010 WHO-CBR Guidelines. It seems that in those years, the leprosy world recognized a need to move (rapidly) into the field of (mainstream) CBR. Subsequently, leprosy organizations such as The Leprosy Mission International (TLMI), Netherlands Leprosy Relief (NLR), and German Leprosy and Tuberculosis Relief Association (GLRA) started to write policy and strategic papers about CBR and, sometimes after initial resistance, leprosy organizations moved slowly into the field of mainstream disability. Associazione Italiana Amici di Raoul Follereau (AIFO) was probably ahead of these developments, since they, at a much earlier stage, started to focus on the rehabilitation of people with all types of disabilities using a CBR strategy to meet the needs of this broad group of people. One could, however, question if the move towards general disability and CBR was wholehearted or if it remained largely cosmetic. Until recently, the leprosy fraternity did not involve themselves in mainstream CBR debates and developments. It has certainly been a missed chance that they—including people with leprosy themselves through IDEA (see Chapter 4.5), the leprosy consumer movement—were not (well) represented in the negotiations around, for instance, the UNCRPD as well as the development of the 2010 WHO-CBR Guidelines. If they had been participating, their voice could have been heard. Nevertheless, more recently a stronger representation by IDEA in organizations such as the International Disability and Development Coalition (IDDC) is a promising, positive development. For far too long, CBR programs have been developed as (pilot) projects that have a start and a finish. Scaling up to program level apparently seems an epic task, although in some countries efforts are made to integrate the projects with national and governmental programs, e.g., in Benin and Uganda. Yet, even in countries with national CBR programs, coverage is often limited to a few provinces, districts, or sub-districts. A scale up of CBR programs is all too commonly ignored; donor agencies and NGOs (non-governmental organizations), it seems, prefer to talk about phasing out. This tendency is quite worrying, because CBR is an approach more so than a project with a head and tail. In fact, actual phasing out would require that all people with disabilities are included in society, have a good quality of life, enjoy their rights, and are able and capable to claim their entitlements. This goal is clearly utopian, and it is perhaps rather naïve to believe that it is achievable at all. For some people and organizations, this aspect of CBR is difficult to understand. It raises questions about the appropriateness of the CBR concept per se, and whether the application of CBR is perhaps often misunderstood. The CBR view should include an old principle, unfortunately not mentioned explicitly in the CBR Guidelines: multi-sectoral collaboration. Too many projects (organizations) review the CBR matrix (Figure 1) and conclude that their activities do not cover all elements of the CBR matrix. This conclusion, however, is a misinterpretation of the CBR Guidelines, since no single organization, government ministry, or sector can ‘do’ CBR on their own. The beauty of the CBR matrix is not the 25 boxes but the entity formed by the lines and arrows that connect those boxes. The matrix suggests that a CBR program should be part of a network of organizations, services, and resources that together form a CBR network and a CBR system. One needs to believe that we should rapidly move away from standalone projects and programs towards networks of complementary (mainstream and specialized) organizations, institutions, and professionals that together ensure that the needs of people with disabilities are being met (Figure 2). Otherwise, this serious misinterpretation of CBR will lead to donor fatigue and continued disinterest from the mainstream development sector as well as governments. The CBR view should show a clear understanding that the cells of the CBR matrix—as it is now—are not exhaustive. The matrix teaches people that our lives can be artificially boxed into 25 (sub) domains. Yet, life and livelihoods are far more complicated and we need to understand that people with disabilities have a variety of hopes and dreams, needs and wants, similar to people without disabilities. Life is more complex than 25 domains. The CBR matrix is a helpful model, but some important domains of life are either not explicitly mentioned (e.g., religion) or not mentioned at all (e.g., the impact of climate change on livelihoods). The CBR view should recognize that the two-dimensional CBR matrix is too simplified a construct. A three-dimensional construct (Figure 3) may help policymakers and practitioners to think a bit more ‘out of the box’, which is a competency much needed in actual CBR field work. CBR could be visualized as a box or a container in which intersectoral collaborations become more visible. One could argue that people with disabilities who receive CBR services are in that box (i.e., the CBR program) for a short or long time to get, for instance, the necessary treatment, education, encouragement, counseling, and appliances. When they do not need services, resources, or facilities anymore, they move out of the program and—if well—are fully (re)habilitated. As every structure needs a solid foundation, the foundation of the CBR box is empowerment. 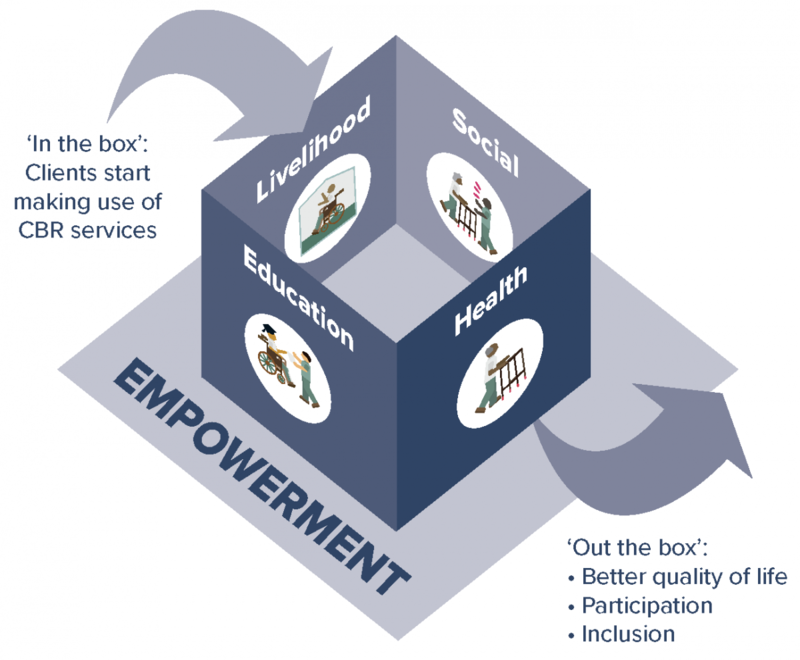 Empowerment is of the utmost importance to support and sustain the four sides of the box: health, education, livelihood, and social life. The CBR view should acknowledge that CBR projects or programs often create dependency instead of working towards independence (from CBR); again, the importance of ‘empowerment’ becomes evident. In many evaluations of CBR projects over the past 20 years, my key question cannot or will not be answered: “how many people with disabilities moved into your ‘CBR box’ at the beginning of the year – and how many moved out of your ‘CBR box’ at the end of the year?” CBR managers instead point out the large numbers of ‘beneficiaries’ of their project or program, leaving the impression that a lot of work needs to be done. FIG 2 The CBR Network. Taken from the PIE approach (Wickenden M, Andrae K, Cornielje H, Post E, Schneider M, Gondwe R. 2016. PIE participatory inclusion evaluation handbook: a flexible approach to evaluating the impact of CBR and inclusive development programmes. http://www.ucl.ac.uk/igh/research/a-z/related-docs-images/pie/handbook). To summarize, the World Health Organization introduced the concept of CBR in the late seventies. CBR was designed to enhance the quality of life for people with disabilities in low-income countries through community initiatives. It is a concept that evolved through trial and error. Over nearly fifteen years, human rights and inclusiveness became key points of CBR. As such, CBR increasingly developed from an individual disability perspective aiming to improve the quality of life into a rights-based strategy aimed at equal opportunities for and inclusion of all , . The concept of CBR is described in the CBR Guidelines, which were published in 2010 by the WHO, UNESCO, ILO, and IDDC . The guidelines describe CBR as a strategy within community development for the rehabilitation, equalization of opportunities, poverty reduction, and social inclusion of people with disabilities. Within CBR, a twin-track approach (Figure 4) is promoted, mainstreaming where possible and special services where needed. This approach ultimately should lead to inclusion of people with disabilities , . Meanwhile, the concept of mainstreaming disability keeps evolving and gaining momentum. Since the late 1990s, an impressive catalogue of policy initiatives have focused on including people with disabilities in any mainstream development, e.g., including them in agricultural development or developments aimed at improving the health status of populations . As a result, under the UNCRPD, all stakeholders involved in development cooperation have a legal responsibility to consult and involve persons with disabilities in their activities. More recently, and possibly in view of the post-2015 Sustainable Development Goals (SDGs) Agenda as well as new jargon introduced by various INGOs organization, it seems CBR is somehow losing its appeal and is mentioned less as a strategy. Disability mainstreaming (one track within CBR) seems to have become the main focus of most organizations, donors as well as (I)NGOs. Instead of CBR, inclusive local development (ILD), inclusive development (ID), or community based inclusive development (CBID) are increasingly mentioned as strategies leading to inclusion. Yet CBR, when comprehensively implemented, is in fact an approach towards CBID (or ILD or ID) rather than a different strategy. Or, as the Asia-Pacific Development Center on Disability describes it: “Community Based Inclusive Development is the end result to be achieved, CBR is the strategy” . 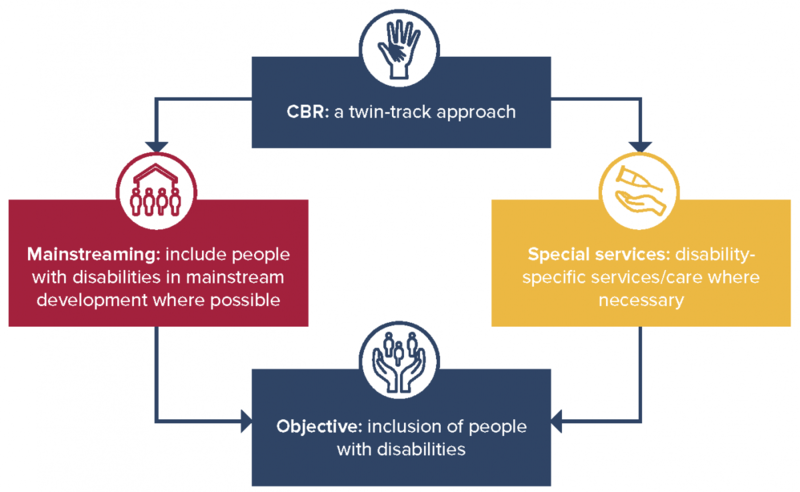 CBR, with the two earlier mentioned tracks, and ILD or CBID, or disability mainstreaming, seem to focus on the same goal: ‘inclusion for all’. Following only the single-track approach of disability mainstreaming carries the risk of losing specific and necessary disability interventions. Even the proponents of disability mainstreaming state that it is important that services for persons with disabilities, like rehabilitation, are preserved , . Disability and rehabilitation expertise is essential, not in the least because, when inclusion in mainstream development is not fully possible—which for various reasons is often the case, the specific available expertise can and should be employed to look for solutions that fit the needs and capabilities of persons with disabilities . The ‘R’ within the acronym ‘CBR’ represents the need for special rehabilitation services. Some professionals and many disability activists criticize the smallest hint of a medical approach. Nevertheless, for many people—and especially those living in low-income countries—these basic but essential (rehabilitation) services can make a tremendous difference in their lives and well-being. Rehabilitation is often the first step for people with disabilities to be able to access other aspects of CBR programs, such as education, income-generating activities, and social life. An improved health condition enables people to keep active and participate in school, work, and social life. This improvement again gives a person the opportunity to generate income and acquire better quality of care: a so-called upward spiral. Indeed, many CBR projects reported that individual interventions brought about change for persons with disabilities, which subsequently made a huge impact on their participation in broader social and other activities. Negative attitudes regarding the value and role of people with disabilities can easily change, as through rehabilitation: people can see that a person with a disability is indeed able to work, go to school, or perform day-to-day activities. Perhaps rehabilitation is more a means than an end, and we should be careful to bypass or even ignore the specific interventions track. Working towards inclusion using a one-track approach is fragile and might even be a harmful exercise. The following anecdote illustrates what might happen if we turn our attention away from medical care and rehabilitation. During an evaluation of a multi-year project focused on how self-help groups improved the quality of life of people with disabilities—especially those with disabilities due to leprosy—quality of life was divided into seven domains or realms: interpersonal relationships, personal development, self-determination, social inclusion, physical well-being, material well-being, and rights/empowerment. The evaluation showed that considerable improvements were achieved in all but one domain: the health domain. This domain, which we assessed by reviewing physical well-being, had not received much attention in this 5-year program. Subsequently, this neglect resulted in a situation in which people affected by leprosy were having dramatic ulcers or other conditions that would require timely physical rehabilitation. In light of the discussion presented in this chapter, we see a great need for a new debate on CBR. It appears that CBR is increasingly being criticized even within its own circle of advocates. Criticism in itself can be very fruitful; it is essential. Surprisingly, hardly any discussions about the usefulness of the CBR Guidelines, a project that has cost a lot of time, energy, and money, have taken place since its launch. Articles that do mention the usefulness of the CBR guidelines are Grandisson ; Grandisson, Hébert, and Thibeault ; and Velema and Cornielje . However, no author, to my knowledge, has yet dedicated a specific study on the use and usefulness of the CBR Guidelines. This project took seven years to finish and involved a large and varied number of professionals, disability advocates, and (I)NGOs. It also was a project that was spearheaded by the WHO and other UN agencies as well as the IDDC with highly committed staff. Yet, as stated, it appears that the debate has stopped regarding new translations of the CBR Guidelines. The critical and maybe even academic debate about the importance of CBR and the CBR Guidelines is, however, nowhere to be seen. Is CBR the solution for all of the challenges people with leprosy face in their life? Certainly, CBR as a philosophy and approach should not be overestimated. Yet CBR offers opportunities when it is well developed as a multi-sectoral system, set up by national governments in collaboration with civil society stakeholders. Whereas (national) governments develop policies, it is local governments, together with civil society, that develop the required services, interventions, and actions needed to ensure that people with disabilities, including those affected by leprosy, will optimally benefit from these arrangements. Top-down planning should go together with bottom-up and contextualized developments. Leprosy organizations, some of which have strong links with national governments and others that work with civil society organizations, are well placed to lobby for leprosy-inclusive CBR development. They should dismiss the misguided idea that they themselves should or can do CBR. Rather, they should join the ranks of those who plead for the inclusion of people with disabilities in all spheres of life. Where they are not yet part of a ‘disability inclusive network’, they should make a bold decision to gradually withdraw from leprosy-specific rehabilitation services. These specific services reinforce the idea that people with leprosy are special, in need of special development and rehabilitation services, and subsequently augment stigma and isolation. People with (disability due to) leprosy are as special as others with disabilities, which is precisely why they also have a right to get the same type and quality of services as others. Such a point of view is not new or revolutionary. It is an old story and yet leprosy organizations, professionals as well as people affected by leprosy, seem to maintain the status quo and may continue to support and develop CBR projects mainly for people affected by leprosy. In their study, Peters et al. look into the meaning of leprosy and everyday experiences and state that ”Leprosy services continue to be needed and should be strengthened and made more responsive to the diverse needs of affected persons where possible, including to some of those formally declared ’cured’”. While not denying that services are continually needed, it is unfortunate that Peters et al. don’t make an unequivocal point about the governance of such services: these services should not be (semi) vertically organized. They should rather become part of existing (health) services or, in other words, they should form an integral part of mainstream (CBR) services. Instead of further strengthening (semi) vertical leprosy services, it would be useful to truly start strengthening local national (health) systems and invest especially in capacity building. No doubt this goal is challenging, but ultimately it would be more sustainable and in the best interest of people affected by leprosy. It is in the interest of the public and of governments, too, as they ask for rehabilitation approaches that are cost-effective. Considering that a relatively small number of people are affected by leprosy and in need of rehabilitation, special organized services cannot not meet the criteria of cost-effectiveness and sustainability. undermining trust between providers and the users and stifling community-driven initiatives by imposing externally conceived top-down solutions . People with disabilities due to leprosy, in fact, deserve more than special services. They have a right to access and use all public mainstream services, which go even beyond the 25 life domains in the WHO-CBR matrix. This message cannot be overestimated and, first and foremost, needs to be communicated and practiced by those working in the field of leprosy. Another approach towards the inclusion of people affected by leprosy that could be realistic is a modified CBR approach, as suggested at the 15th International Leprosy Congress. The approach that was suggested uses the existing leprosy-specific services or infrastructure to facilitate “reverse integration,” i.e., integration of people without leprosy in these programs. General CBR services could be set up around existing leprosy services. During the 15th International Leprosy Congress, it was noted that people affected by leprosy who are in need of rehabilitation are often spread out over a large geographical area, a factor that in itself is already challenging for establishing (cost) effective and sustainable developments . An interesting example of such a philosophy is illustrated at the Green Pastures Hospital of the International Nepal Fellowship (INF) in Nepal. Their board decided to change from specialist leprosy to general services, which opened up the possibility of using facilities and expertise for the rehabilitation of non-leprosy affected persons while also moving towards the reduction of stigma (see Chapter 4.5) and prejudice against patients with leprosy . The CBR program of Partnership for Rehabilitation (PFR) that was already offering its services to people with other types of disabilities formed a great complementary service in which referrals became well institutionalized . During a fieldtrip, as part of an evaluation in an Asian country, we met a young man who was diagnosed with and treated for leprosy in the past. During treatment, he received eight months of vocational training in metal work and, as a result, got a job in a metal workshop. However, as he realized that he could do more he decided to look for another job. We visited and interviewed him at his workplace and he expressed that he was very satisfied with his new working environment. Within five minutes, however, we realized that we had better stop the interview, as we seriously regretted that we had met in his work environment, where we were almost sure that his current boss was not aware of his previous medical condition and, in fact, why should he have been aware anyway? This story is one of success, as the young man was successfully treated for leprosy; he received good quality vocational training that enabled him to get a job; and his confidence and initiative to change work places for a better future illustrates empowerment and inclusion in society. The young man no longer is a person affected by leprosy, but a capable young man who can compete with others in society. When we, the evaluation team, asked to interview a person affected by leprosy, it would have been better to leave this man alone. In a way, we confronted him with his previous disease at the risk of losing his job. When people exit the ‘CBR box’ (Figure 3), we should also treat them this way and make sure we do not keep the stigma alive, when society has already accepted that very same person. While stigma is a factor that should be considered in an individual rehabilitation plan as well as in the organization of CBR, one should be aware that the very same staff and services that pay attention to stigma may be stigmatizing contributors. In conclusion, is there a panacea and is CBR the answer to the needs of people affected by leprosy? The CBR approach in various contexts and often in various forms and models can be meaningful for the inclusion, empowerment, and improvement of the quality of life of people with disabilities, including people affected by leprosy. It is not the only answer, as the practice of mainstream CBR often ignores the needs of people affected by leprosy, maybe because of stigma, maybe because of existing (semi) vertical or special rehabilitation programs for people affected by leprosy. It is of crucial importance that the leprosy field (INGOs and NGOs) truly mainstream its rehabilitation activities. At the same time, the ignorance that is seen among mainstream organizations needs to be tackled and not just accepted. Thanks to all of those people, disabled and non-disabled, professionals and non-professionals, whom I met during the past 32 years and who told me and showed me what they saw as essential rehabilitation. They continually challenged and sharpened my ideas and insights about Community Based Rehabilitation. They helped me to understand that purist ideologies are not the answer to the needs of (still) the majority of people with disabilities who live on the fringes of society, in slums, and in the periphery of many countries where their voice is not heard because they are not allowed to have a voice, where their talents and abilities are not recognized and developed because no one is interested in them. They helped me to be satisfied with the small—at times maybe even insignificant—services that were offered because those services were the only and best things available, as those who are in (political) power are not interested in people with disabilities. ^ Finkenflügel H, Wolffers I, Huijsman R. 2005. The evidence base for community based rehabilitation: a literature review. Int J Rehabil Res 28:187–201. ^ Lemmi V, Gibson L, Blanchet K, Kumar S, Rath S, Hartley S, Murthy GVS, Patel V, Weber J, Kuper H. 2015. Community based rehabilitation for people with disabilities in low and middle income countries: a systematic review. Campbell Systematic Reviews 11.
a, b World Health Organization. 2010. Community-Based Rehabilitation: CBR Guidelines. WHO, Geneva, Switzerland. a, b Miles M. 2004. CBR in Africa—between evidence and ideology. Disability World 24. ^ Ndaziboneye B. 2002. People with disabilities ‘owning’ CBR, p 110. In Cornell University ILR School, Community-Based Rehabilitation (CBR) as a participatory strategy in Africa. Gladnet Collection, DigitalCommons@ILR. ^ Helander E. 2007. The origins of community based rehabilitation. Asia Pacific Disability Rehabilitation Journal 18(2):3–32. ^ WHO, UNESCO, ILO. 1994. Community based rehabilitation for and with people with disabilities: 1994 joint position paper (a59204). WHO Institutional Repository for Information Sharing (IRIS), Geneva, Switzerland. ^ Haig AJ, Im J, Adewole D, Nelson V, Krabak B. 2009. The practice of physical and rehabilitation medicine in sub-Saharan Africa and Antarctica: a white paper or a black mark? J Rehabil Med 41:401–405. ^ World Health Organization. 2003. International consultation to review Community-Based Rehabilitation (CBR), Helsinki 25–28 May 2003. WHO, Geneva, Switzerland. a, b World Health Organization. 2006. Community-based rehabilitation guidelines. ^ Cornielje H. 2009. The role and position of disabled people’s organisations in community based rehabilitation: balancing between dividing lines. Asia Pacific Disability Rehabilitation Journal, Guest Editorial 2:3–14. ^ Arole S, Premkumar R, Arole R, Maury M, Saunderson P. 2002. Social stigma: a comparative qualitative study of integrated and vertical care approaches to leprosy. Lepr Rev 73:186–196. ^ Van Brakel WH, Sihombing B, Djarir H, Beise K, Kusumawardhani L, Yulihane R, Kurniasari I, Kasim M, Kesumaningsih KI, Wilder-Smith A. 2012. Disability in people affected by leprosy: the role of impairment, activity, social participation, stigma and discrimination. Glob Health Action 5. doi:10.3402/gha.v5i0.18394. ^ Asnake M, Dawit M, Ahmed M, Genebo T, Mekbib B. 1999. The involvement of the general health service staff in the management of leprosy in the southern region, Ethiopia. Ethiopian Journal of Health Development 13:187–194. ^ Thomas M, Thomas MJ. 2007. Global trends in disability rehabilitation and their implications for leprosy programmes. Lepr Rev 79:10–16. a, b Deepak S, Gopal PK, Hisch E. 2000. Consequences of leprosy and socio-economic rehabilitation. Lepr Rev 71:417–419. ^ Nicholls PG. 1999. Guidelines for the social and economic rehabilitation of people affected by leprosy. ILEP, London, England. ^ World Health Organization. 2007. WHO/ILEP technical guide on community-based rehabilitation and leprosy, p 1–49. ^ Cornielje H, Veldman E. 2012. The dream of inclusion for all – powerful CBR training materials. Enablement Publisher, Alphen aan den Rijn, The Netherlands. a, b Khasnabis C, Motsch KH. 2008. The participatory development of international guidelines for CBR. Lepr Rev 79:17–29. ^ Bruijn P. 2014. Inclusion works! Lessons learned on the inclusion of people with disabilities in a food security project for ultra poor women in Bangladesh. LIGHT FOR THE WORLD, Veendendaal, The Netherlands. a, b Van Veen SC, Regeer BJ. 2013. Meeting the challenge of the rights-based approach to disability: the changing role of disability-specific NGOs and DPOs. Nord J Hum Rights 31:359–380. ^ Grandisson M. 2015. Developing guidelines for program evaluation in community-based rehabilitation. Ph.D. thesis. Université d’Ottawa/University of Ottawa, Ottawa, Canada. ^ Grandisson M, Hébert M, Thibeault R. 2014. A systematic review on how to conduct evaluations in community-based rehabilitation. Disabil Rehabil 36:265–275. ^ Velema JP, Cornielje H. 2010. Developmental articles backbone principles of the CBR guidelines and their application in the field of leprosy. Asia Pacific Disability Rehabilitation Journal 21:26–42. ^ Atun R, Bennett S, Duran A. 2008. Policy brief: When do vertical (stand-alone) programmes have a place in health systems? Health Systems and Policy Analysis, WHO European Ministerial Conference on Health Systems, Tallinn, Estonia, 25–27 June 2008. World Health Organization, on behalf of the European Observatory on Health Systems and Policies. ^ Walter CS. 1999. Social aspects and rehabilitation. International Leprosy Congress, Beijing, 7–12 September 1998. Workshop report. Lepr Rev 70:85–94. ^ Brandsma JW, Schwartz RJ, Anderson AM, Herm FB. 2005. Transformation of a leprosy hospital in Nepal into a rehabilitation centre: the Green Pastures Hospital experience. Lepr Rev 76:267–276. ^ Brandsma JW, Harijan T, Wagle P, Baxter KA. 2008. Partnership for rehabilitation: looking beyond impairments. Indian J Lepr 80:19–29. ^ Finkenflügel H, Rule S. 2008. Integrating community-based rehabilitation and leprosy rehabilitation services into an inclusive development approach. Lepr Rev 79:83–91.